The huge mass of evidence that Mars presents in support of his theory is irresistibly intriguing. -- Booklist. Angels, Aliens and Archetypes was a two-day symposium featuring some of this country's foremost visionary thinkers considering the premise that human encounters with the Other are real on many levels. 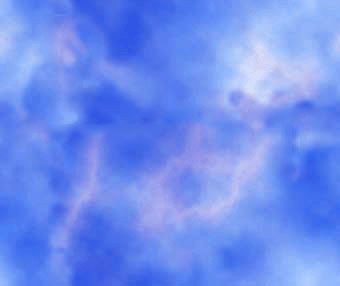 They are perhaps most real "at the seat of the soul," where, as Novalis wrote, "the outer and inner worlds meet." Speakers explore ways in which primordial images of the personal and collective unconscious move beyond psychic frames of reference, taking physical or paraphysical form. Myriad questions regarding this study are addressed through a forum of speakers, panel discussions, exchanges between speakers and audience, evocative music and visual displays and an art show. The audio and videotapes contain the complete symposium, although Jacques Vallee is only available on audio. Author of the Aquarian Conspiracy talks directly about how to view the overwhelming data. From the 1987 AA &A Symposium. The famous author of Communion and Cat Magic displays his persona. Richard Grossinger is an anthropologist and author of Planet Medicine: from Stone-Age Shaman to Post Industrial Healing and the Night Sky. Keith Thompson is a clinical hypnotherapist specializing in providing support and understanding in working with people who have had non-ordinary experiences. Michael Grosso is a philosopher and author of The Final Choice. His thesis is that current psychic anomalies are symptoms of an evolutionary crisis of human consciousness. Kenneth Ring is author of Heading Toward Omega and Life at Death. He is professor at University of Connecticut and the past president of the International Association for New-Death Studies, and Associate Director with Alise Agar of The Omega Foundation. Ken, with Alice Agar, put the Angels, Aliens, & Archetypes Symposium together, an elegant and unusual event. His talk is a clear exposition of unusual phenomena. Angels, Aliens and Archetypes 1987 Symposium: The Monument On Mars- A Mythic Link? Richard Hoagland is a science writer, research pioneer in extraterrestrial archaeology and author of The Monuments of Mars; a City on the Edge of Forever. Jacques Vallee is an astrophysicist, computer scientist, UFO research pioneer and author of numerous books about UFO phenomena, including, The Invisible College, Anatomy of Phenomenon, Passport to Magonia, and The Edge of Reality with J. Allen Hynek. TAPE 2 includes amazing astrological research by JUDITH HILL, a humorous, clever panel including RUDY RUCKER, IVAN DRYER, and ROBERT ANTON WILSON; the tape ends with an incredible instrumental performance by the Australian digereedude STEVEN KENT. ANOMALIES CONFERENCE launching. And what a day it was. The first of its kind. Not to be missed...EVERYBODY in top form, including Faustin BRAY, Brian WALLACE, Robert LARSON, Robert Anton WILSON, Ivan DRYER, Stan TENEN, Carol DRYER, Rudy RUCKER, Arthur and Ruth YOUNG, Nick HERBERT, Judith HILL, John KELLY, Dan DREYSEN, and digereedude Steven KENT. The videos convey more of the essence of the day. Faustin BRAY, founder and director of the conference, introduces keynote speaker Robert Anton Wilson and tells us what it's all about. Robert Anton WILSON gets us going with a follow--up to his previous talk on these subjects, "Anomalies, Coincidences and Synchronicity." Arthur and Ruth YOUNG talk to us about extensive personal exploration into unusual events in their lives. TAPE 4 We started the day with Ivan DRYER, and in the true spirit of team work and partnership, renown psychic Carol DRYER brought the eve to a close with predictions that made the hair stand up on the back of the neck. Stan TENEN gave an extremely concise and rich demonstration of his latest discovery of the connection of the hand shape and the formation of the sacred alphabets. John KELLY told the story of his being a UFO contactee and the face on Mars contingent was represented by Dan DREYSEN. Brian WALLACE showed his grandfather, Grant WALLACE's, cosmic charts and astral inhabitants drawings from the Pleides. This was a very visual event and still the audio can give you lots of information. Michael Grosso is a philosopher and author of The Final Choice. His thesis is that current psychic anomalies are symptoms of an evolutionary crisis of human consciousness. Recorded at the Institute for the Study of Consciousness, 11/19/87. Recorded at the New Age Renaissance Fair, 11/17/90. This one is pretty good if you want to see history from the planets view. Neil Freer is a researcher, writer and lecturer whose chief influence is the work of Sumerian scholar Zecharia Sitchin, author of The Twelfth Planet. His book, Breaking the Godspell, "explores the ramifications of the archaeological, astronomical and genetic proof for our being a genetically engineered species and presents the ramifications of this paradigm of human nature that resolves the Creationist-Evolutionary conflict." This one is breathlessly amusing and idiosyncratically weird, ...but good, by the co-editor of Mondo 2000. Edwin C. May, Ph.D., a brilliant lecturer, nuclear physicist and author of 130 papers, is Director of the Cognitive Sciences Laboratory in Menlo Park. He was Program Manager for a similar five-year effort at SRI International. This lecture overviewed research of : 1) anomalous cognition, when information is gathered from the environment and transferred when all known sensory channels are blocked (ESP, clairvoyance, telepathy, precognition), and 2) anomalous perturbation, when there is interaction with the environment (psychokinesis, teleportation, materialization), focusing on anomalous cognition. Experiments in remote viewing--a type of cognitive mental phenomena whereby subjects mentally describe distant scenes were discussed. A telephone conversation with the long-term investigator from England. An amusing, precise character, he candidly substantiates the findings of the phenomena of the last ten years. This tape includes sounds gathered from the sites. A must for crop circle enthusiasts. A surprising look at unusual visitations. Definitely Strange. From Roy Tuckman on "Something's Happening." Learn how to read the Tarot. All you need is this book and a Tarot deck. A visit with the long-term investigator from England. The man who has been intensively studying the agriglyphs for12 years casually and confidently presents his case; he is an amusing, precise character and he candidly substantiates the findings of the phenomena. A must for crop circle enthusiasts. 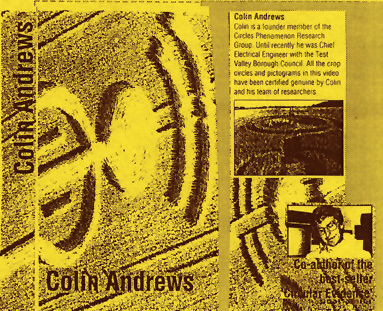 Colin Andrews produced this video with aerial, ground and microscopic photographs of the crop circles in England. He discusses at length the different possibilities for the circle phenomenon and invites others to express their opinions of the intriguing occurrences.